Odd molecules in space that absorb light from distant stars have been detected in the center of our galaxy, giving scientists new hope of solving a nearly century-old mystery of what the molecules are made of. That discovery, in turn, could help reveal how these enigmatic compounds were created, knowledge that researchers say could unlock secrets regarding interstellar chemistry and possibly the origins of life. The light from any object can be imagined as a combination or spectrum of color. The spectrum of a star can reveal a great deal about its composition, much as how the color of a fruit can help identify it and give an idea of whether it has ripened. The spectrum we see from a star is affected by gas and dust in the space between the star and us. Scientists have identified some of this absorbing material, but the culprit behind the class of absorptions known as "diffuse interstellar bands" has eluded researchers for 90 years. "There have been many suggested identifications of specific molecules for some of the diffuse interstellar bands, and none of them has proven correct,"study lead author Thomas Geballe, an astronomer at Gemini Observatory in Hawaii, told SPACE.com. Discovering what causes these bands could help reveal the chemistry that occurs in space. "There is a good general understanding of the chemistry that produces simple molecules like water, carbon monoxide, and ammonia in interstellar space. However, our knowledge of the more complex chemistry that produces larger molecules is much less secure – in large part because we do not have specific identifications for those large molecules," Geballe said. Better knowledge of interstellar chemistry might help understand how life evolved on Earth. "Some scientists think that the complex chemicals that are a key to life starting on Earth came from space and seeded the Earth," Geballe said. Until now, all diffuse interstellar bands were found at visible and very near-infrared wavelengths. 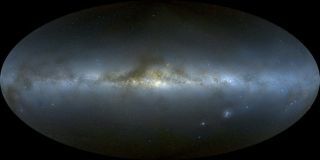 Moreover, none of them was detected in the direction of the Milky Way's core. While investigating the spectra of hot stars in the center of the galaxy, Geballe and his colleagues said they unexpectedly encountered these features in their starlight, in infrared wavelengths. These new details as to all the wavelengths these molecules absorb could help pinpoint their identity. The fact they are found in the galactic center, where the environment is considerably harsher than farther out, also suggests these compounds are relatively tough, another clue as to what they might be, Geballe said. "Most experts in this field think they are likely to be large, carbon-based molecules," Geballe said. "They probably are created either in the interstellar clouds where they are found or material ejected from red giants, by chemical reactions in either the interstellar gas or in the red giant winds." "If the molecules producing diffuse interstellar bands are in fact large, carbon-bearing molecules, they could be closely related to molecules important to life such as amino acids and could play an important role is that process," Geballe added. "We won't know for sure until we find out exactly what they are." Geballe and his colleagues hope to investigate these molecules further as a tool for understanding the interstellar environment elsewhere in our galaxy and in distant galaxies. The scientists detailed their findings online Nov. 2 in the journal Nature.